In 1791 Boswell published his Life of Samuel Johnson, launching a literary genre that remains our most entertaining species of memoir, the tale of friendship between two people, written by the pair’s less famous member. The keen pleasure afforded readers of such books derives in large part from the high concentration and quality of the gossip they contain. There is no shame in our curiosity about the table talk, bad marriages and moral lapses of cultural icons. Anecdotes and even quotes from these books lodge like cockle burrs in the memory. While reading Michael Peppiatt’s wonderfully indiscreet memoir of his thirty-year friendship with the celebrated British painter Francis Bacon, I was reminded of Sir Vidia’s Shadow, Paul Theroux’s 1998 account of his scary friendship with V.S. Naipaul. This is the subjective story of two lives, focusing on the complex, volatile relationship that bound Bacon and me together over those three decades. Drawn from diaries and records I kept at the time, it presents an intimate, revealing portrait of the artist as friend and mentor. Bacon comes across here in ways that no formal biography could convey: close up and unguarded, grand and petty, tender and treacherous by turn, and often quite unlike the legend that has grown up around him. One of the memoir’s greatest strengths is the sense it conveys of Bacon as a social animal, gregarious and full of contradictions. He loved gambling, good food and good wine, and could be generous and funny with the people he liked, while coldly dismissive of his fellow artists, a trait he shared with Naipaul, who was given to murmuring about other writers that he didn’t “think there was much there.” Bacon had little use for the work of Jackson Pollock, Willem De Kooning, or Robert Rauschenberg, and he preferred Andy Warhol’s films to his art. There’s a funny scene when David Hockney enters a Paris restaurant and “comes over to kiss Francis affectionately on either cheek. As David moves on, Francis takes out a handkerchief and wipes his cheeks very elaborately. When Peppiatt first met Bacon, the artist had reached a peak of popular acclaim, coming off a retrospective the previous year at the Tate Gallery in London. He would have a second Tate retrospective in 1985, an unheard-of honor for a living artist. He died in Madrid in 1992, leaving an estate valued at eleven million pounds to John Edwards, his lover during the last twenty years of his life. In 2013 his triptych, Three Studies of Lucian Freud sold for over a hundred and forty million pounds, setting a world’s record for art auction prices. 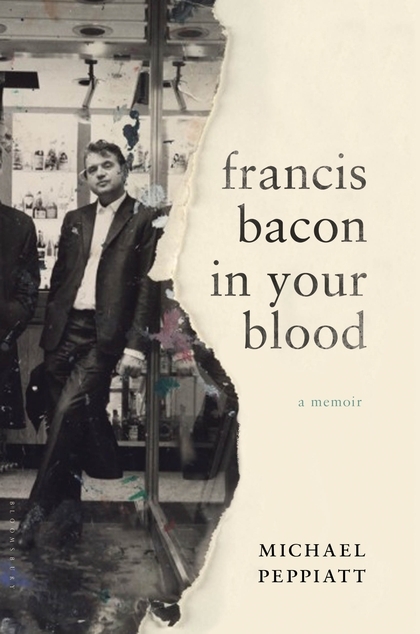 For any reader whose only knowledge of Bacon comes from his paintings of screaming popes, this convivial memoir will humanize the artist behind the work. His friends included celebrities, bar owners, criminals and royalty. Peppiatt knew all of Bacon’s inner circle, most of whom seem to have accepted his presence, with the glaring exception of George Orwell’s widow, Sonia whose persistent dislike is shudderingly funny. We get to know Lucian Freud, Michel Leiris, and Muriel Belcher, the formidable lesbian proprietress of The Colony Room in Soho, a private drinking club. Well, what Peter himself liked was young boys. He was actually younger than me, but for some reason he didn’t seem to realize it. It was the most total disaster right from the start. Being in love in that extreme way—being utterly obsessed by someone as I was–it’s like having some dreadful disease. I wouldn’t wish it on my worst enemy. And we had these four years of continuous horror, with nothing but violent rows. Word of Lacy’s death reached Bacon just as his 1962 Tate retrospective was opening. Next was George Dyer, a petty thief from Soho who would become Bacon’s muse and model. History would repeat itself in the most macabre fashion, when in 1972 Dyer committed suicide in Bacon’s Paris hotel room on the eve of the artist’s exhibition at the Palais Royale. After that Bacon swore off intimate relationships but he soon began seeing John Edwards, who was kind and markedly stable compared with Lacy and Dyer.